FiberTalk – it’s a Fun Chat! Last week, I chalked up a new experience! In the evening hours on Tuesday, I went out to my workroom, cleared some space on the table amongst an ever-growing pile embroidery threads and current stitching projects, and set up a laptop with a mic and some headphones. Then, I connected via Skype with Gary Parr and Christine Williams of FiberTalk, a podcast for fiber art hobbyists, to enjoy an hour and a half of spontaneous conversation about stitching and such. It isn’t often that I get to have a good chat about needlework and related subjects with other folks who are equally enthused! Retrospectively, I had only a hazy idea what we talked about. I did recall mentioning putting my shoes on to work – vital information for your everyday life, I’m sure! The whole experience was a lot of fun! If you can get past my very outdated picture (I really am going to update photos of myself this spring) and occasional bursts of impromptu chortling, feel free to join the three of us and listen in on our conversation. Gary & Christine are a blast, they have lots of great insights for stitchers and fiber hobbyists, and they keep the conversation rolling. 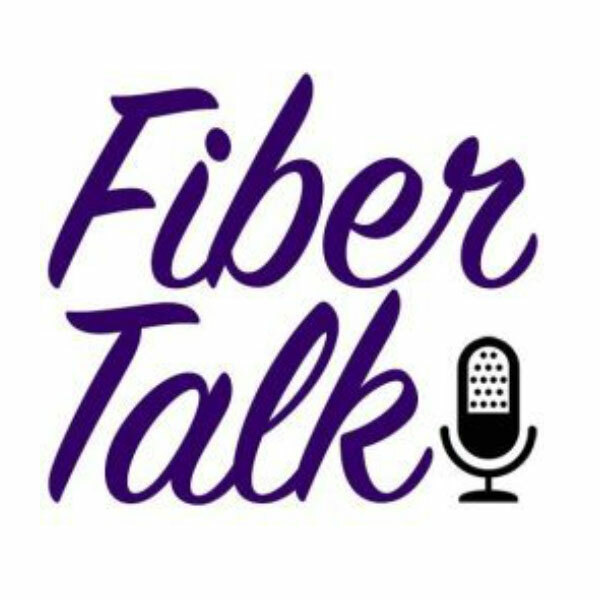 You can listen online directly through the FiberTalk website here, or you can listen to FiberTalk via iTunes (go ahead and subscribe, so you can keep up with upcoming episodes!) or listen and subscribe via other podcast apps, depending on what kind of phone or tablet you use. You’ll find 11 episodes of FiberTalk available to listen to. Each is just around an hour or an hour and ten minutes long, making them perfect for listening to during a nice stitching break or over a long commute. I’ve really enjoyed hearing the stories of the other designers and fiber enthusiasts Gary and Christine have interviewed, and I think you will, too! If you give it a listen, I’d love to hear your feedback! Any topics you wish we had touched on? Any topics you’d like to hear more about? I’m all ears! Feel free to chat about it in the comments below! Happy Monday! Hope your week’s off to a great start! Finally back through Chrome still trying to workout why I can’t access on my Safari. Anyway listening to your interview while I write this and enjoying the interview. Looking forward to the weeks blogs now I’m back. Hi, Anita – I’m still checking on the Safari question. It’s working on my end, through Safari, and I don’t think there’s any kind of geographical difference, since you’re fine using Chrome. I wonder if you should check for updates for your operating system. Apple has a fairly recent OS update. That might help? Sorry, but once again can’t get what you advertise on your newsletter. Always, always a disappointment as all one gets is not available. Is it because we live in South Africa and not America? All your links are unavailable. Such a washout. Hi, Jean – I’m not sure what the difficulty is. I have other readers in South Africa whom I’ve heard from, who are not having a problem getting through to the site or clicking through the links in the newsletter. It may be a problem on your computer, or with your ISP, or your email service provider. You might try refreshing your browser, emptying your cache, or deleting cookies to see if that helps? Oh Mary – I’ve just finished listening to you on Fibre Talk – – what a treat! I get their podcast every week and have enjoyed every episode. Lots of great tips and hints and such interesting people – I highly recommend it. Also – – it was so lovely to listen to you ‘shooting the breeze’ with like minded people – and having never heard you speaking before – – you sound exactly like yourself! 🙂 Thanks, Wendy! I sound a lot like the me in my videos, too – so I suppose that’s a good sign! How exciting, Mary! I will listen tonight as I stitch! I really enjoyed listening to the podcast as I did my stitching today. I especially liked hearing about how your day is structured. Hey Mary, I listened to your interview on the podcast – enjoyed it very much. I hope your health is holding up and you are better. Thanks for all the info you share on your blog. I would like to see that redwork table runner. Remember redwork is one thing I enjoy very much. Thanks again!! Yep, Gary was right! It took forever! Good morning Mary! Enjoyed listening to the pod cast session. You have the patience of a Saint embroidering that beautiful fragile egg! I used a dremel saw way back in my craft days, not on eggs though! Do you know if Jennifer Riefenberg’s Carrot design can be purchased by kit or pattern? I have a confession that I didn’t have time to listen to her pod cast session this morning. I quickly looked around the internet, but had no luck. Not like I need another project, but I must say your enthusiasm and energy to complete projects helps me to forge on!! Hi, Lynn – Glad you enjoyed the podcast! I had the impression, listening to Jennifer’s episode, that her designs are kitted up for the classes she gives. I haven’t seen any of her designs for sale anywhere, otherwise. Jennifer’s designers are only available through her classes. I do believe you can ghost a class to get the designs. Thank you for sharing the recommendation of Yo-be cream. I’ve tried everything this winter with little luck. Literally have a pile of jars and tubes of creams, oils, etc and still my hands were cracked, dry and looked horrible. After 2 nights use, there is noticeable difference in my hands. Thank you!!!!!! you do for us out here. Thanks to Mary for a terrific show and to everyone who has listened and is planning to listen. We’re having great fun doing these podcasts and hope they’re informational and entertaining for everyone. I took a road trip today and had no audible book to listen to. Light bulb moment- Mary Corbet on Fiber Talk! Great podcast, my first, and listened to one more. Great way to spend a day driving. When I listened to Fiber Talk this morning, I was delighted to hear your comments on the use of magnifiers. I too am very near sighted and usually stitch without my glasses on, the room is a blur but I can see my stitching perfectly. Thank you for validating my way of stitching! I’ve found this and enjoyed a new thing to listen to while stitching! I have also discovered the podcast series called “Stitchery Stories” which has also been super interesting!